It's now officially autumn, which means beer season. September and October see a wave of Oktoberfest festivals across the country, featuring German culture, tons of food — and of course, great brews. The first Oktoberfest was held in Munich in 1810, when the city's citizens were invited to celebrate the marriage of Crown Prince Ludwig to Princess Therese of Saxe-Hildburghausen on October 17 of that year. Today Munich's Oktoberfest—known as die Wiesn to locals—is the world's largest fair, attracting six million people from around the world each year. Only beer brewed within Munich city limits can be served at Oktoberfest, and millions of litres of it are consumed there each year. The modern-day festival ends on October 3, German Unity Day. Kitchener, Ontario hosts what is probably Canada's best-known Oktoberfest, and it's certainly an event to put on your beer bucket list. But these festivals occur all across Canada, from coast to coast and north to south. Some of them are small and some draw crowds from away, but they've all got something to offer for fans of the kinds of beverage that are best when drunk out of a stein. Here's our roundup of Canada's 11 best Oktoberfests — start marking your calendars! This is the big one — Kitchener's Oktoberfest is the largest Bavarian festival in North America and has been running for more than 40 years. Highlights include a Victorian-era Thanksgiving celebration, the Miss Oktoberfest gala ball, and a ton of food and drink to enjoy. Penticton's Oktoberfest packs a lot of celebrating into a single day. Go to the city's convention centre to enjoy traditional German drinking songs, a beer variety that includes both imported Bavarian brews and fair-trade African beer, and Okanagan wines. Steam Whistle Brewery, located in Toronto, is hosting Oktoberfest festivities in three cities across the country. Toronto's party happened last weekend, but you can still catch the action in Vancouver on September 28 or Calgary on October 5. The brewery is also continuing its popular Oktoberfest beer stein promotion, where bars across the country are offering a Steam Whistle beer stein if you purchase a litre of its beer. Does beef go with beer? 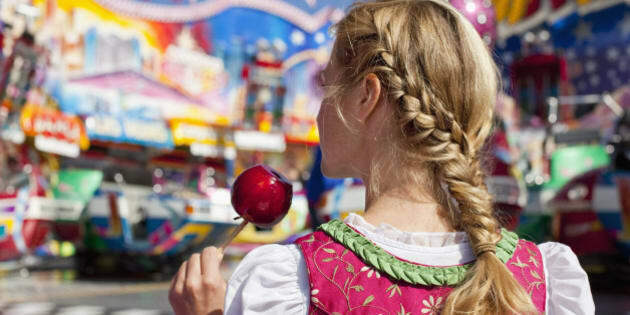 The Stampede city celebrates Bavarian heritage as well with its annual Oktoberfest. The festivities include beer from local craft brewers, eats from the best of the city's restaurants, and an authentic Oompah band. Oktoberfest weekend in Regina is celebrated with the German Canadian Society and the Regina German Club, which offers food and beer from the Bavarian region all year round. The Mr. and Ms. Oktoberfest prizes will go to the costumes best embodying the spirit of the festival, and the evening festival on the 28th features a pig roast. This year's Festival Oktoberfest des Quebecois has already passed, but it's worth getting exciting for next year's event now. The festival features Quebec microbrews, family events, local artisans, and wines and spirits for those who might not be feeling the hops. Thunder Bay has a sizeable German-Canadian population, and this year's Oktoberfest will be the city's biggest. Sleeping Giant Brewery is debuting an exclusive beer for the event, which features a performance by the Polka Pirates, freshly baked pretzels, and authentic German food. Celebrating its 34th anniversary this year, the North Shore Bavarian Society's Oktoberfest is the largest one east of Kitchener-Waterloo. Three thousand people visit this small town each year for the festivities, including a beer garden, a dance, German bands, a Schnapps bar, and both Canadian and German foods. Ottawa's Oktoberfest features a band called Schteev und die Lederhosers, which is reason enough to be in Canada's capital city this weekend. But here are a few more reasons: local band Hollerado, three Bavarian beer haus, Cyrus from the Trailer Park Boys, and pretzel-eating contests. Beau's Brewery hosts an annual Oktoberfest celebration that raises money for a variety of great organizations, including United Way Ottawa, Kiva, and Rethink Breast Cancer. Bus packages from Ottawa, Montreal, and Cornwall are available for those hoping to attend the festival, which includes a variety of Beau's beers as well as cask brews from 20 different breweries, selections from Ottawa-area restaurants, and music from a ton of great artists including Kathleen Edwards and Sloan. Capping off what is a very busy weekend for Oktoberfests around the country, Toronto's festival appeals to VIPs by allowing them the chance to pay a bit extra for Fraulein service at their tables. It's the little things. Attendees can also enjoy traditional Bavarian dancing and Mill Street's special Oktoberfest brew.